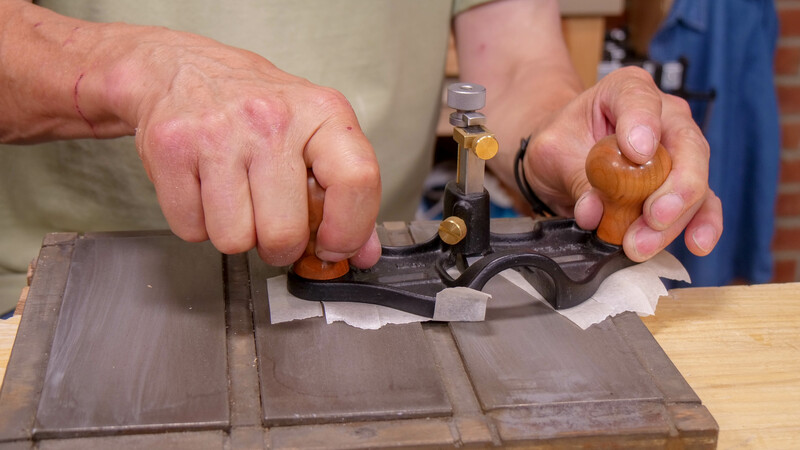 Before you use your router plane, it is important to check that the leading edge of the cutting iron, the fore edge, is parallel with the actual sole of the plane as it may need to be corrected, flattened and polished before use (Paul sometimes refers to this process as initialising). 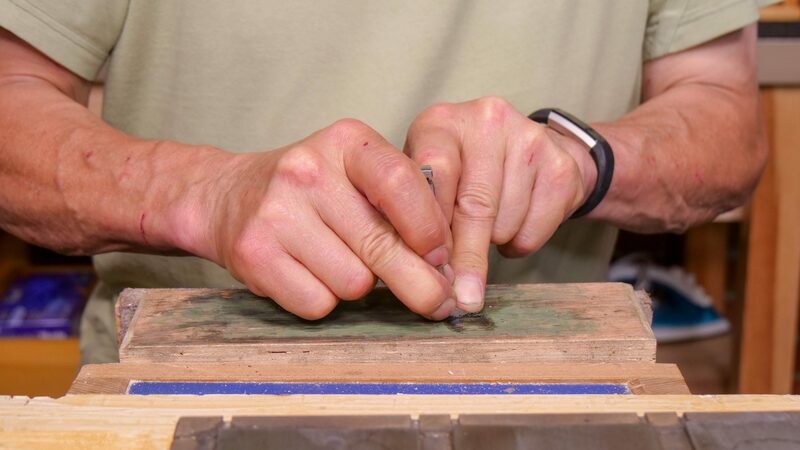 This process will usually only need to be done once (as long as future sharpening is consistent) and may not even need much work if it has been purchased brand new. Place the cutting iron into the body of the router plane and adjust the cutting iron until it is barely protruding beyond the sole. 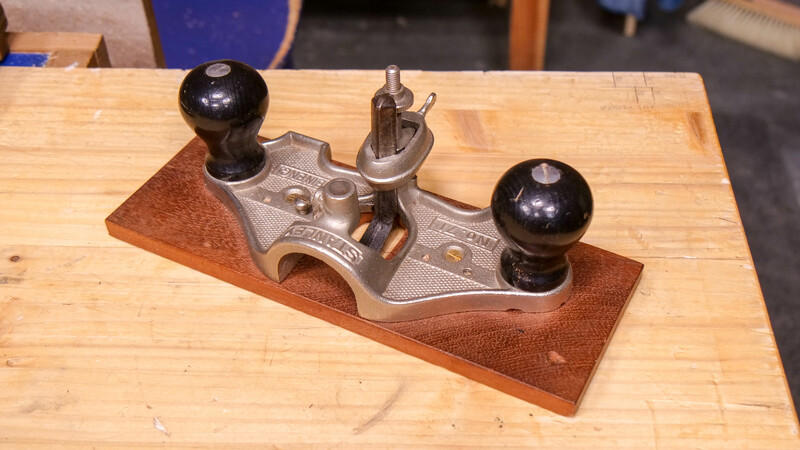 Place the router plane on the finest grit diamond plate and rub back and forth lightly two or three times. Check the underside of the cutting iron to see where the most material has been abraded away at the cutting edge, you will be able to tell as the newly abraded surfaces will appear shiny. 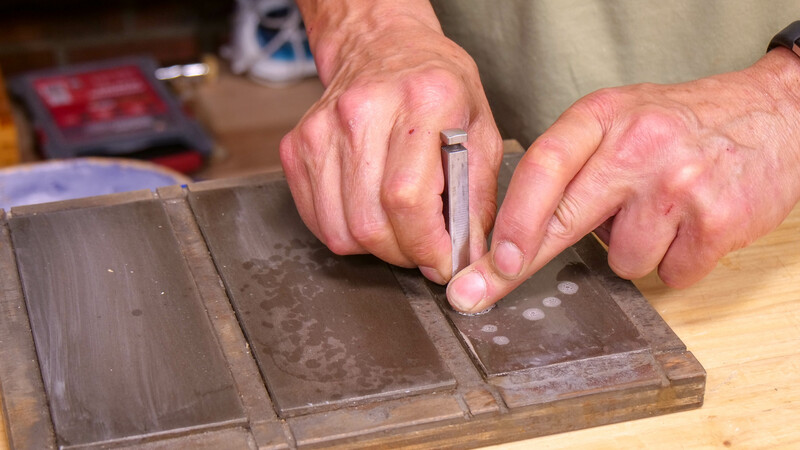 Remove the cutting iron from the body and, much like setting up a chisel, place the underside of the cutting iron flat on the sharpening stones. If the newly abraded surface is parallel to the cutting edge, the edge is in line. Use even pressure on each level of coarseness until the whole of the underside of the cutting iron is shiny, not just the cutting edge. 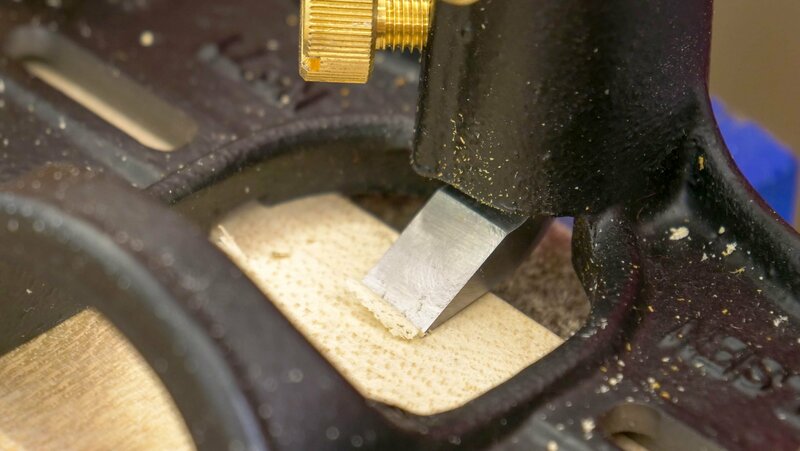 If the newly abraded surface is not parallel and is wider on one side, this means that one side is lower when housed in the plane and clamped, you will need to remove the cutting iron from the body of the router plane and correct the underside on the sharpening stones. 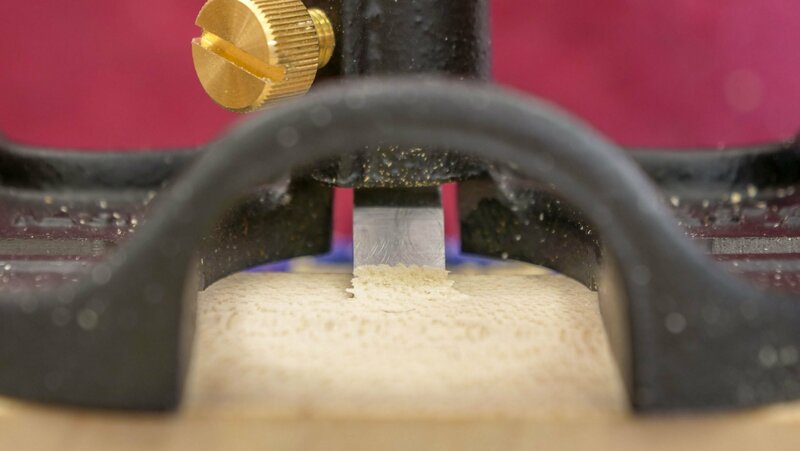 To do this, apply more pressure to the lower side (in our case it was the right side of the blade) until the opposite side starts to abrade away and you are left with a parallel abraded line on the cutting edge. This means the cutting iron has been corrected, continue to abrade away on the diamond stones until the whole of the underside is consistently flat to the new edge and shiny overall. Finish abrading by applying buffing compound to the wooden face of the strop to polish the underside. Approximately 30 times is usually sufficient (Do not use the leather face as this will result in rounding the cutting edge of the cutting iron and the plane will not cut). To avoid the metal sole marking your projects, you can add an additional wooden sole which can be removed if needed. 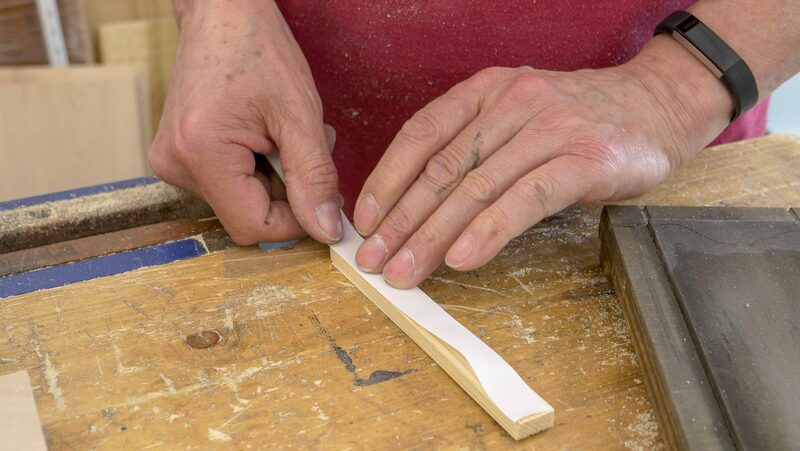 You can make this longer than the actual sole to enable you to extend the width of the router plane which enables you to work over larger recess areas. You will need wood that is around ½” (13mm) thick. 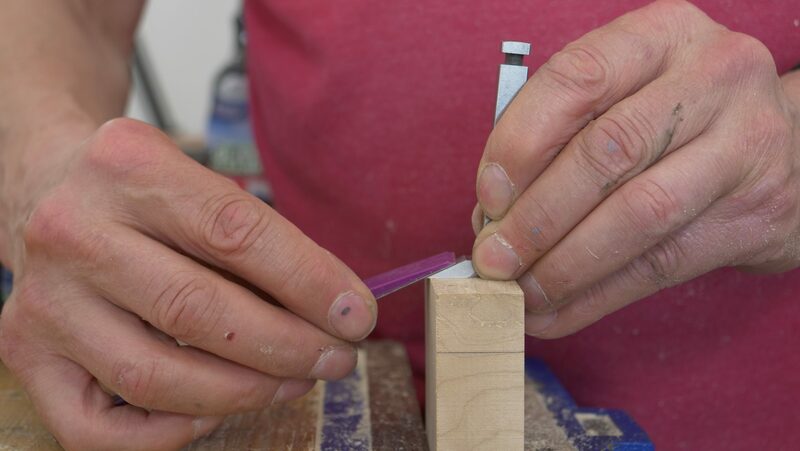 Use a brace and bit to bore two adjoining 1” (25mm) diameter holes next to each other. Use a rasp to abrade these down to create one elongated hole, this will be where the cutting iron passes through the sole. Screw on the sole using the holes either side of the cutting iron and file the screws so that they sit below the surface of the wood. 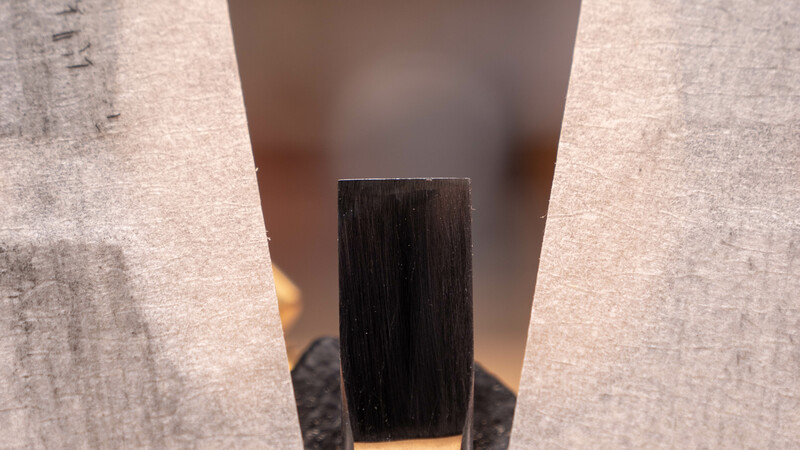 To sharpen the main bevel of the cutting iron, place the bottom of the cutting iron on a block of wood and rest a sharpening paddle on the bevel until the angle is at the same angle as the bevel on the iron. Make small circular motions moving across the full bevel, then move onto the next grade paddle until the bevel near the cutting edge is shiny. Paul uses the EZE-LAP purple (400 grit) and red (600 grit) paddles. 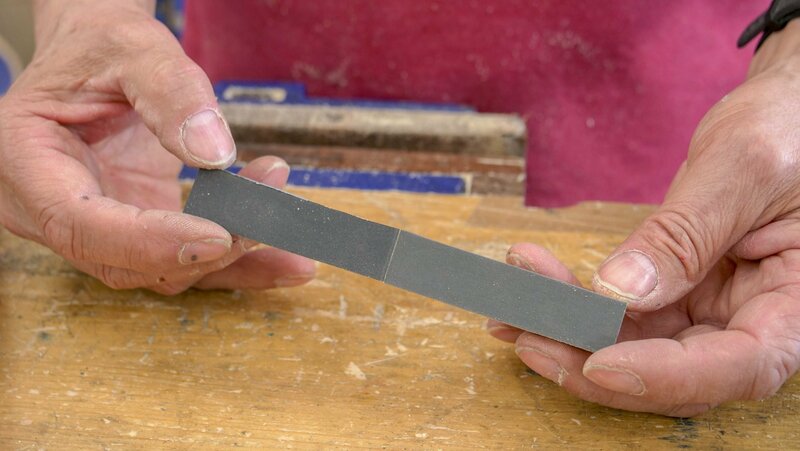 If you don’t have sharpening paddles, you can make one by using double sided tape to stick different grades of abrasive paper to each side of a piece of wood ¼” by ¾” by 6” long. Paul recommends 250-600. Stick double sided tape to either side of your piece of wood. 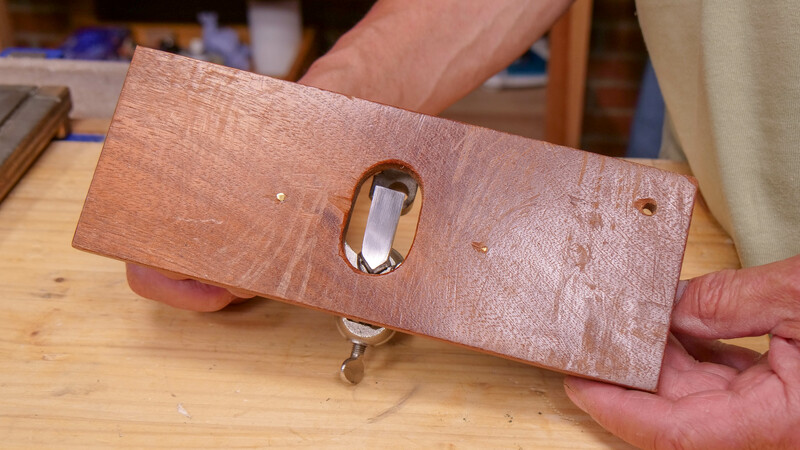 Place a piece of wood into the vise, wide enough to balance the blade on and high enough that the paddle sits at the right angle against the blade. Put the cutting iron back into the body of the plane and test the cutting iron on a scrap piece of wood by taking a fine shaving to see if the cutting iron is square. It is square when it takes an even shaving across the whole width of the cutting iron. The design of the plane ensures that the cutting iron is presented to the wood at an angle to the underside of the iron. This angled presentation is critically important as it provides a relief on the underside of the cutting iron. Without this the plane will not cut because if the cutting iron is flat against the wood it will glide over the surface of the wood without cutting. 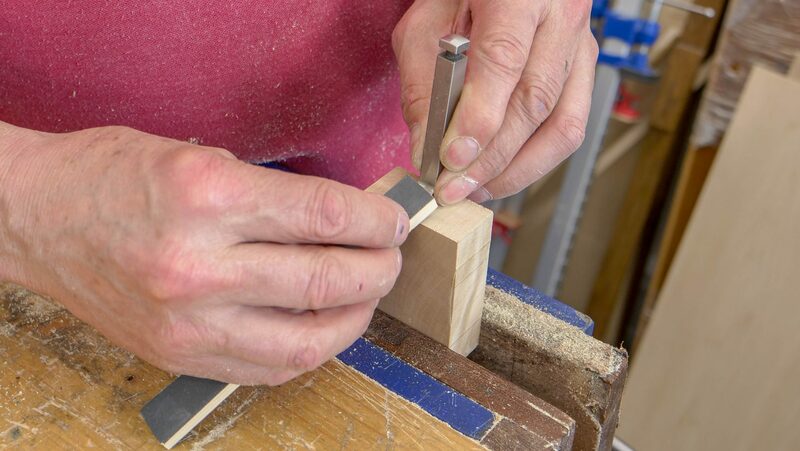 It is important to remember that the cutting edge may not appear square even when it is in line with the body of the router plane, this will be due to the angle of relief the cutting iron is sat at combined with the angle on the cutting iron bevel. 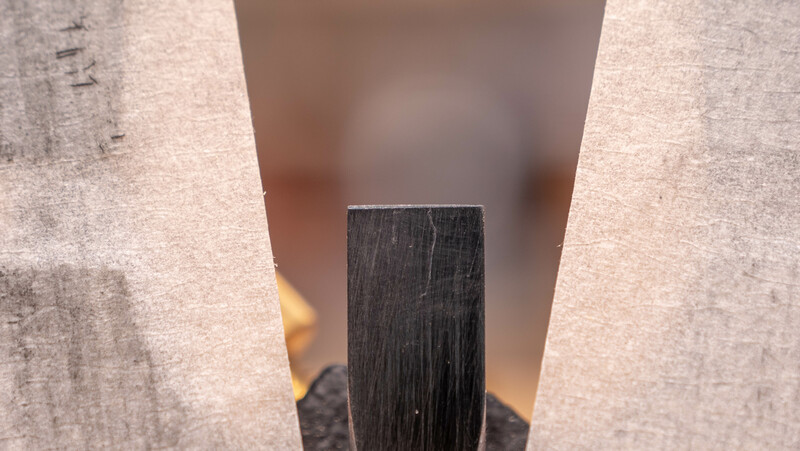 If you have initialised the cutting iron during the setting up process, and have sharpened the bevel so it takes an even shaving, you can be sure that it is presented squarely and parallel to the wood’s surface and this is what matters. Finish by polishing the bevel on the leather strop, charged with buffing compound. Test on a scrap piece of wood with the blade protruding slightly so you can see if you get an even cut all the way across. If your blade cuts evenly all the way across, you can be sure that this is square. It would be great to have Paul explain when it would be appropriate to use a pointed cutting iron instead of the square ended one that he uses most of the time. I have only seen the pointed one use in a few pictures here and there. He might have discussed this somewhere but I can’t find it. Paul says it’s not likely to happen as this was developed as a fine surfacing tool and is therefore generally unnecessary for the type of work it’s used for. In my opinion, I haven’t seen any benefits over using the square edged ones, and they’re very hard to sharpen. I picked up a router plane online. It came with the pointed iron. Are there any pointers one should be mindful of when purchasing a straight replacement iron? Mine is a Stanley of some age but I do not know the number on the plane off the top of my head. Paul would recommend Lee Valley Veritas. Veritas make irons for their planes which will fit in a Stanley.